Warm the vocal chords and tune your air guitars for Women in Strata’s karaoke night! This event will be pure fun at a fabulous venue, and we encourage you to bring along your colleagues and besties alike, to have a night off and sing as though no-one is listening, all while raising money for Share the Dignity! If you don’t fancy yourself as a singer outside of the shower, come along to support your friends who do and vote for your favourite. We promise that no-one will be forced to sing if you don’t want to, but don’t let any lack of skill stop you as it is all about having fun and yes, there will be prizes! Stay tuned for more details and booking information soon! You will want to get in early for this event as numbers will be limited. We’re very pleased to announce that in conjunction with Chambers Russell, WiS will be presenting Jamila Rivzi, bestselling author, media personality and all-round amazing woman. As well as a key-note from Jamila, we’ll be holding a panel session to provide you with tips and tricks on building your own networks. Followed, of course, by some networking. Details on both events to follow. Watch your inbox. 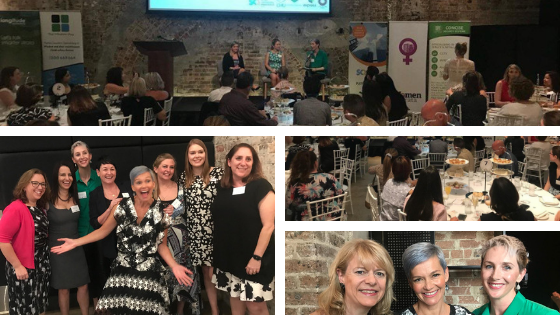 Here at WiS, we’re all still riding the amazing, empowering energy from the SCA (NSW) and WiS International Women’s Day High Tea. We hope you are too. Listening to Kirsten and Anne-Maree tackle the real issues, the hard issues, like quotas and #metoo, with such intelligence and strength was equal parts enthralling and exciting. Especially when they didn’t agree yet were able to so obviously respect each other’s point of view. Amanda was equally impressive as she expertly guided the conversation to and through these difficult but important topics. I was fortunate enough to sit next to the hilarious Jessica Rowe during the panel discussion, who wrote furious notes the whole time. She was clearly also enthralled, and her own keynote was a fabulous balance of funny and empowering. Her advice of ‘just keep showing up’ has stuck with me as so poignant in a world where women are sometimes expected to ‘gracefully’ exit. It was a wonderful event. And best of all, as well as raising awareness for Share the Dignity, we raised $803.00. Thank you for everyone who purchased raffle tickets. One of the resounding themes of IWD around the world was the concept of women lifting each other up. Women have been unfairly led to buy into the concept of scarcity when it comes to female success. We’re told there is limited space for us, and that we need to fight each other for that space. This has created a false culture of women feeling they must compete against each, instead of lifting and supporting one another. But the thing is, every time a woman succeeds into a role usually held by a man, she is opening the door for another to follow her. Our networks are the most valuable asset any of us have in career and business. As Kirsten so clearly put it, we look to fill roles with people we know and trust. For men, those networks are usually made up of, well other men. It may not be a deliberate strategy to keep women out, but that is the result nonetheless. However, every time a woman is able to break through those ranks, and into those networks, she has the ability to extend those networks to include her female colleagues. In supporting each other, in extending our networks, in sharing our knowledge and in lifting others up, we can make noticeable inroads to achieving gender parity in senior management, on boards, in politics and within the judicial system. There is no scarcity of roles for women, if we work together to create those roles and open those doors.